Finance Minister Naoto Kan has emerged as the front-runner to become Japan's next prime minister, following the resignation of Yukio Hatoyama. Support appeared to be coalescing around him after two other possible candidates backed him for the leadership. So far only he and a little-known lawmaker, Shinji Tarudoko, have declared an intention to stand. 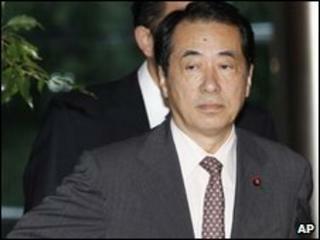 Mr Hatoyama stepped down on Wednesday, amid a row over a US military base. He had been unable to fulfil an election pledge to relocate the Futenma airbase off Okinawa, in a bid to reduce the US military presence on the southern island. His Democratic Party of Japan (DPJ) is moving swiftly to elect a new leader ahead of upper house elections in July. Naoto Kan, 63, took over as finance minister in January, and also serves as deputy prime minister. He is one of the DPJ's most high-profile lawmakers, because of his role in exposing a scandal involving HIV-tainted blood products in the 1990s. Foreign Minister Katsuya Okada and Transport Minister Seiji Maehara had been tipped as possible rivals, but both said they would back him. "In last August's elections, voters put their hopes in us to take power and change Japanese politics. We came to a consensus that Mr Kan, who is keenly aware of that, is the one who is appropriate," Mr Maehara said. The chairman of the party's environmental panel, Shinji Tarudoko, is so far the only other lawmaker to have stated an intention to stand. He is thought to have the backing of some of the younger party members. But it is not yet clear who Ichiro Ozawa, widely seen as the key power-broker in the DPJ, will support. Mr Ozawa, who also stepped down on Wednesday as DPJ secretary general because of a funding scandal, leads the largest faction of DPJ lawmakers. The party will meet on Friday to elect its new leader. Will Japan's global ties change?